The world has filled with uncertainty and strife. Kingdoms quarrel and war. Religions argue which paths are true. Magical orders drift further from the concerns of the mundane. Yet rumour spreads of lost civilizations found, sacred writs surfacing and king and commoner alike dreaming visions dark and foreboding. The faiths try to drown the tales, the lords to quench the Tellers, yet word drifts to the ears of men. Within them all lies one theme that fills hearts with fear; The Absolution... the end of all things! Can any arise to alter the course fo a doomed world? Who could undertake such an impossible task? Who will heed the warnings? An entirely unique world of tremendous depth; there are no orcs or horses here! Fluid archetypes replace static classes; begin as a warrior, evolve into a thief or mage! Skill-based development as opposed to level-based; master only skills you practice! 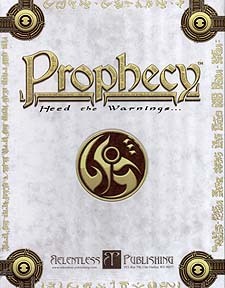 Percentile game mechanics easily adapt to other systems; use Prophecy as a sourcebook! This box contains everything needed to begin the quest of Prophecy.